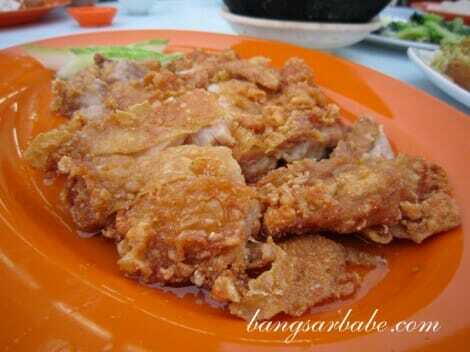 If you were to say that to me in Malacca, I’d probably bring you to Restoran Chin Chai in Taman Kasturi to eat. 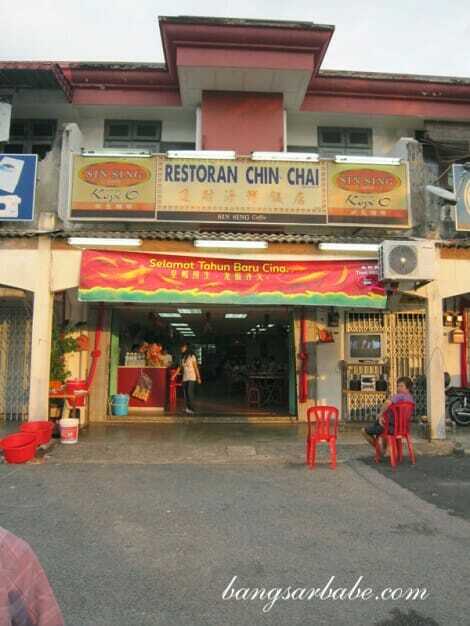 I initially thought the place was intentionally named Chin Chai but according to rif, the owner’s name is really Chin Chai. We were there early so we didn’t wait long before we got to eat. 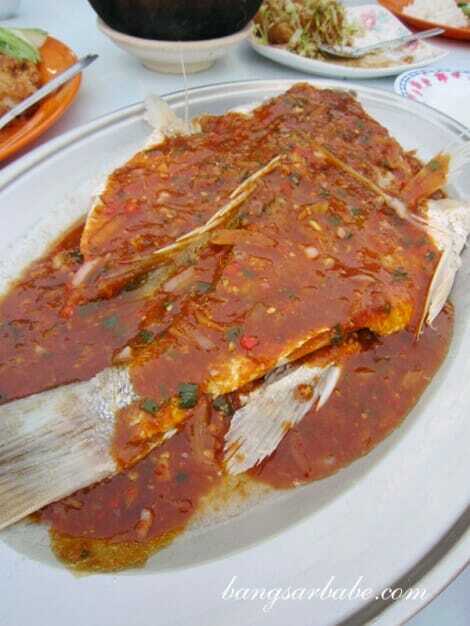 Instead of having steamed fish, we ordered the ikan jenak “Jiong Jeng” style based on the lady boss’ recommendation. Bad choice. This was the most disappointing dish of the lot. The fish was fresh and firm but the sauce tasted flat. All we tasted were the chilli padi and chilli paste, which killed the taste of the fish. The Thai-style tofu was quite nice. 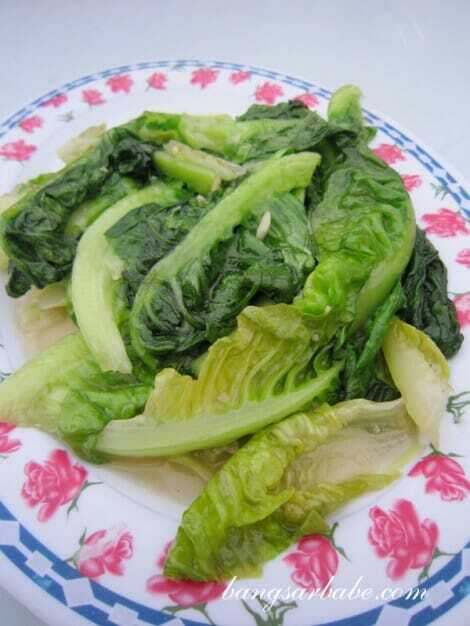 Served with julienned lettuce and cucumber, the tofu was crisp on the outside and soft at the centre. 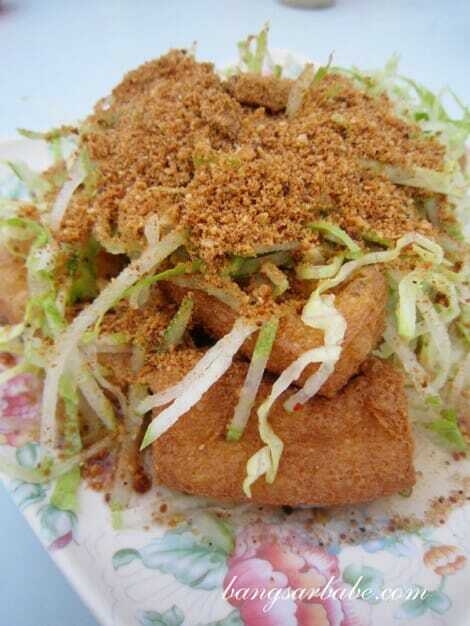 I liked the peanut powder topping on top – it gave the tofu a good aroma and went well with the tangy sauce. 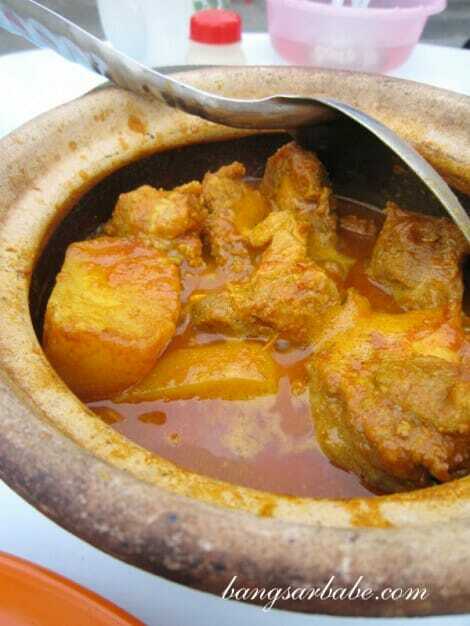 Our favourite dish that night was the pork ribs curry, which came in a claypot. The ribs were cooked till tender and falling off the bone so it was a lot easier to eat. What made this special was the thick and spicy curry gravy it came with. Good stuff, especially with white rice. rif insisted on ordering the lemon chicken at Restoran Chin Chai, and it was easy to understand why. 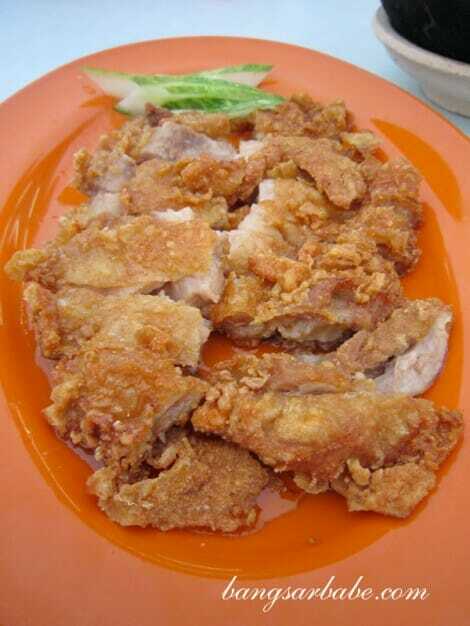 Despite it being an ordinary dish, the chicken was deep fried till crispy and moist at the centre. The lemon sauce had a good balance of flavours but there wasn’t enough to eat with the chicken. The stir-fried yau mak was cooked with garlic and a bit of ginger. Nothing great, but good enough to balance out the earlier dishes we had. Dinner cost RM90 for all the above and rif’s father told me the fish was RM30. Definitely more reasonable than Restoran Sedap Dan Murah, I felt. Verdict: The food at Chin Chai is simple and hearty. Try the pork ribs curry when you’re there. the lemon chicken looks sinfully delicious…..so does the curry pork ribs…and the toufu…and even the not-so-good steam fish look yummy too…lol..
if there is 1 suggestion that i can think of to improve your blog (if that’s even possible)….i would love see bolder rating on the ambiance/food/price that you give. i noticed that your ratings very often fall in the range of 5-6…which to put it bluntly….means very little to us readers. i can completely understand that not all places/foods are that good/bad and deserve extreme ratings, but i am hoping that the rating can actually give us readers a good indication whether the place/food is worth trying, and a 5-6 rating is not giving us that indication. note: my friend beside me says 5-6 rating means if we feel like going then go, if not then don’t go! lol. just my very personal opinion!! btw…..actually even without any rating given, i also feel like trying out all the places you introduced. LOL. Noted on the ratings. I rarely give super high ratings unless the food is super special or extra delicious. 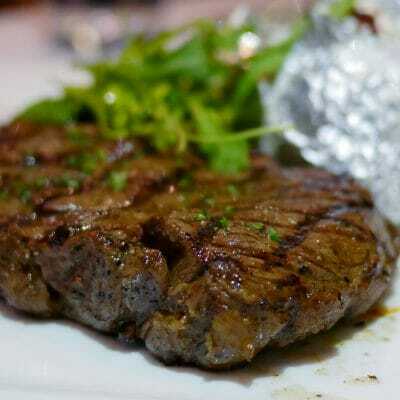 If it’s good, hearty food, the rating is often 6/10. Nonetheless, I’ll see if I can come up with a ratings chart to make things clearer. Luckily the cooking here is not “chin chai”. Really catchy name for a restaurant! Hmmm…I only know of the yu yi BKT in old klang road. Same branch ah? 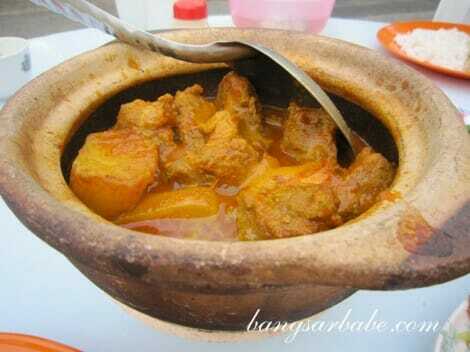 d pork ribs curry claypot definetely d BOMB..
looks very lemak n rich……. i think i will eat 2 bowl of rice with this..
hey, ive been there a couple of times. you shud try their seaweed soup, it’s really gud. also, their thai tofu is the best you can get anywhr in mlk.